arcomed is fully aware that today, one of the most important challenges in health administration organizations is cost-efficiency – and, at the same time, improvement of quality standards with regard to safety and patient focus. Our goal is to realize both targets through the All-in-OneCONCEPT™. Selection of the right medical device (and, of course, the right infusion pump) in the hospital setting represents a key decision toward achieving that purpose. According to Edbrooke, D., et al., A new method of accurately identifying costs of individual patients in intensive care: the initial results. Intensive Care Medicine, 1997. 23: p. 645 – 650, staff cost in Intensive Care Units in the UK is 60% of total costs. Allowing the clinical staff to act in a quick and intuitive way becomes key to improving performance and ensuring a high level of clinical quality. For this reason, arcomed is concerned to develop tools in order to improve user convenience and reduce lead time. 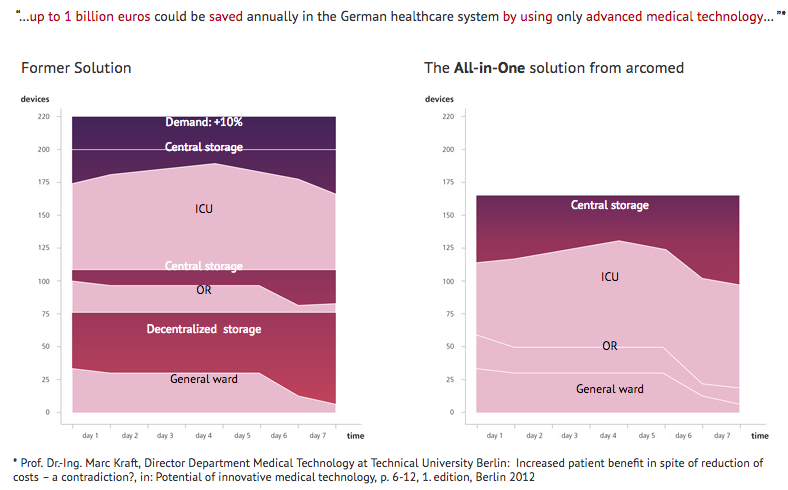 The implementation of the All-in-OneCONCEPT™ allows hospital staff to fulfil their needs with fewer infusion pump units; hence, different hospital departments can share the same pumps, leaving more spare units available with a smaller infusion pump fleet. 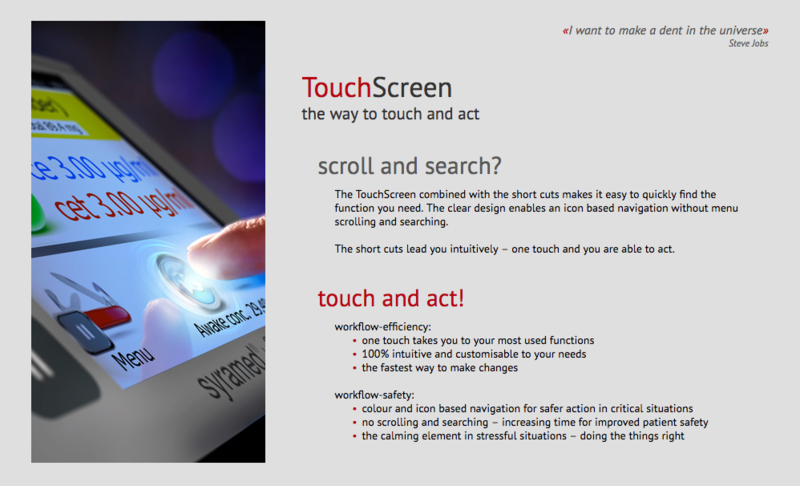 Touchscreen technology represents a new, simpler way of interacting with a device, featuring an icon-based interface and customizable desktop with the most common shortcuts. This feature allows the user to avoid spending time scrolling through the menu to select the right choice.